Donald Trump Jr. posted a statement on Twitter excusing his behavior in addition to the infamous chain of emails with Russian-connected music publicist Rob Goldstone. The Goldstone emails arrange his meeting with Kremlin-connected lawyer Natalia Veselnitskaya. Donald Jr.'s Tweets were a vain attempt to mislead the American public. 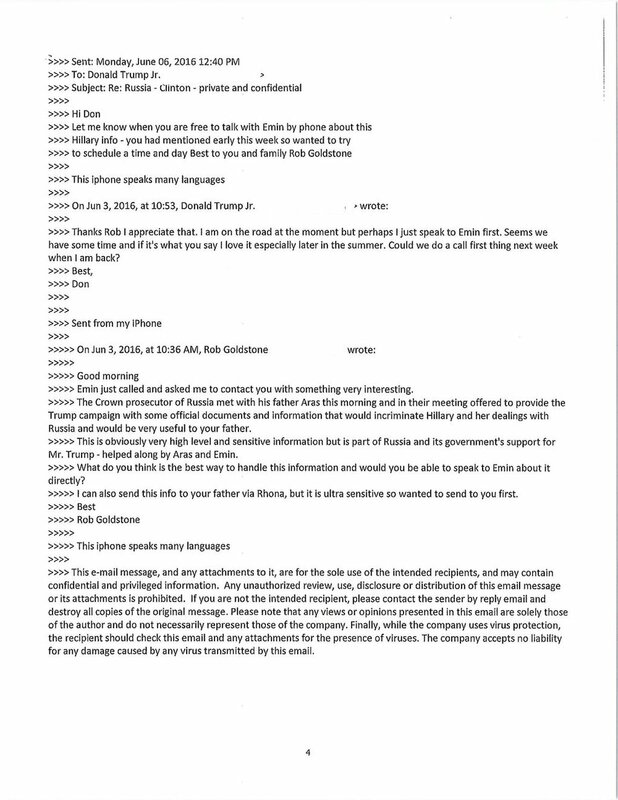 Accompanying Donald Jr.'s first release at 5am EST, was the following: "Here's my statement and the full email chain"
Donald Jr. released the emails in an alleged 'demonstration of transparency.' 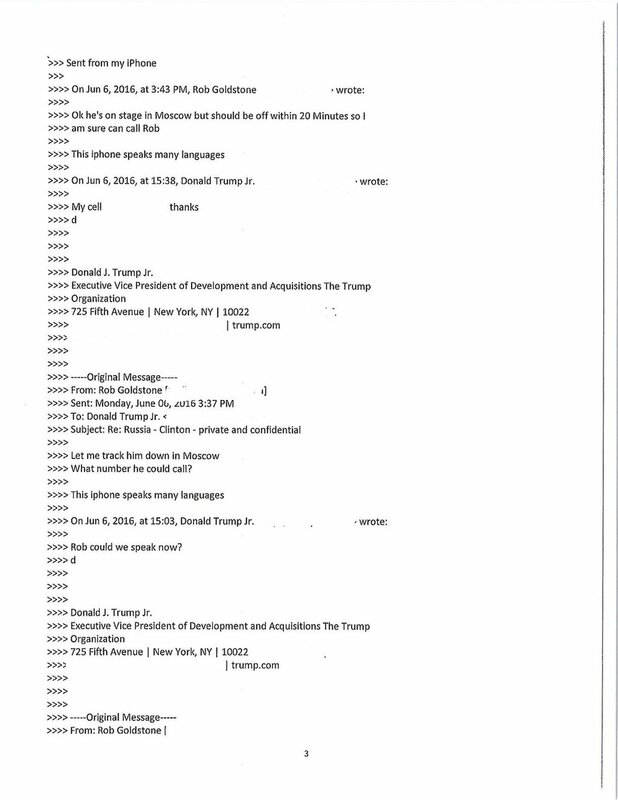 In actuality, the New York Times had informed Donald Jr. and the Trump administration their intention to publish a story based on these documents. Donald Jr. hoped to get in front of the Times' reporting in order to control the narrative. However, introducing nonsensical political spin (Trump administration specialty) is tricky when the public has access to the documents in question. Donald Jr. and Trump advisors have a reduced ability to manipulate the public perception of facts when the evidence is layed bare before them. 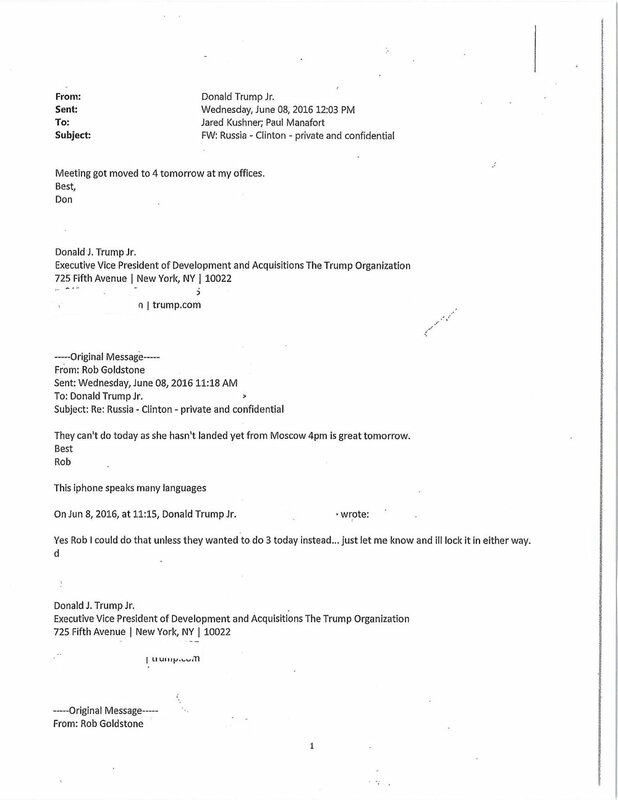 Page four of the release acknowledges that the Russian government is providing Donald Jr. damaging Clinton material because of its support for Trump's candidacy. Goldstone's wording indicates that Donald Jr. needed no prior explanation regarding the Russian preference. Goldstone makes it clear that Donald Jr. was already aware the Russian government was working on his father's behalf to influence the election. For an ordinary person not colluding with a foreign power to influence an election, that Goldstone quote would send shockwaves through the system. "Part of Russia and its government's support for Mr. Trump." That statement in a vacuum is a matter acknowledgement that a foreign power hopes to determine the outcome of a U.S. election. Donald Jr. did not question this, nor the motives of the Russian government. Why would the Kremlin support Trump's candidacy? That should have been Donald Jr.'s first question. Or, 'how should I bring this information to the authorities.?' Heck, even Donald Jr. pondering, 'with whom in the Trump campaign would this information be most beneficial?' But no, Donald Jr. expects everyone to ignore common sense and believe that he was unfazed and kept this revelation a secret. Donald Trump praised his son's decision to post the emails, stating, "My son is a high-quality person and I applaud his transparency." Even in opposite world what Donald Jr. did was corrupt and illegal. Nothing about Donald Jr.'s attempts to collude with Russia is praiseworthy. No amount of Tweets can replace what he did. If conservative pundits have it their way, Donald Jr. will be the first criminal to avoid punishment because he was "transparent" with releasing self-incriminating evidence. It is time the mainstream media and federal investigators move beyond seeking to determine whether the Trump campaign colluded with Russia to influence the 2016 election, and work to determine the depth and breadth of the collusion. May 1 Trump Dog Whistles Confederate-Loving GOP Base and Praises Andrew Jackson.